There are times you may just want to enjoy the water while using a paddle especially if you love fishing. Though casting off from the shore may yield excellent results, it’s always better to pedal where the catch is. And a kayak is one of the most efficient watercraft that will enable you to get closer to where the fish are. 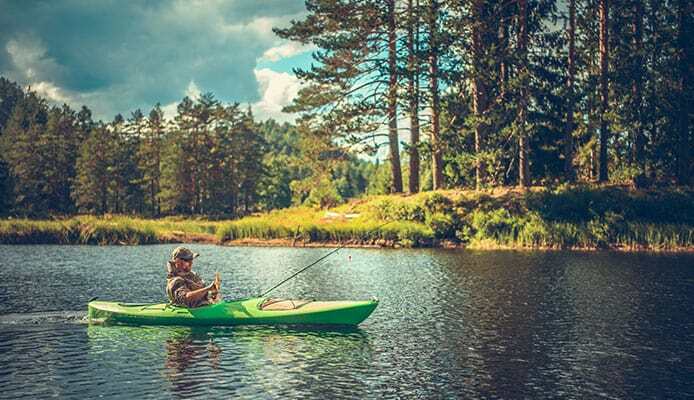 We’ve compiled some useful information that will not only help you understand what a pedal kayak is, its uses and when you might need one but also choose the best fishing kayak with pedals that suits your preferences. Here are our top rated pedal kayaks for fishing to make it easy to find your next catch. Let’s find out. Native Watercraft Slayer is a little compact fishing kayak that weighs 81 pounds when fully rigged and 62 pounds without the drive installed. This angler kayak with pedals is designed to fit on a pickup truck back. It has the propeller drive system to power you backwards and forwards as well as rotational pedals to enable you cross the river easily. It’s very stable in the water and measures 34 inches wide to enable you stand up for better line casting. This kayak also has a sealed compartment at the front with adequate storage on board. It can carry up to 500 pounds despite its smaller size to help you attach all the fishing gear you’ll need during your fishing trip. It also has dual rod holders, a left handed rudder operating handle and a right handed cup holder to help you sit back and relax while pedalling your way to the best fishing spots. The armchair seat offers comfort and can be adjusted to reach the pedals easily. 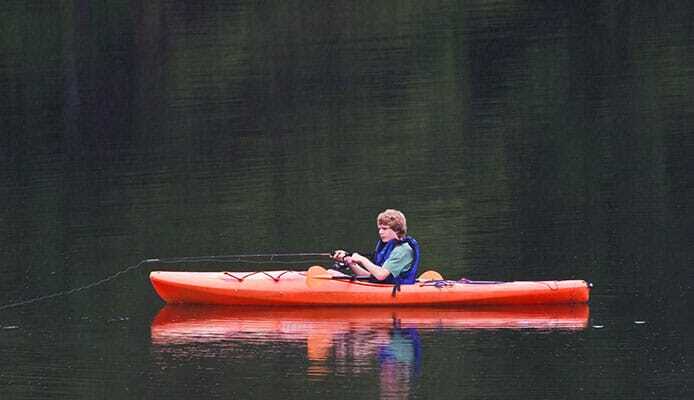 BKC UH-PK14 14 foot fishing kayak is designed to be fast and stable on the water. It has a rear rudder system to enable you maneuver easily along the way. It’s a 2 person kayak with both seats having their own propeller and pedals to help you move faster. The kayak’s seats are ergonomically molded and can be adjusted. 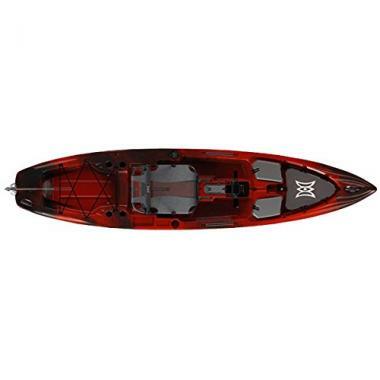 This kayak has enough storage for all your fishing gear and comes with molded fishing rod holders. It can hold up to 660 pounds. It has 12 scupper plugs, two paddle keeper, one front and one rear handles, two articulating rod holder, two side handles, two paddle drives and more. Perception Kayak Pescador Pilot is capable of hauling 475 pounds. Its 33 and ¾ inches wide and measures 12 and ½ feet long making it narrower compared to other pedal kayaks. 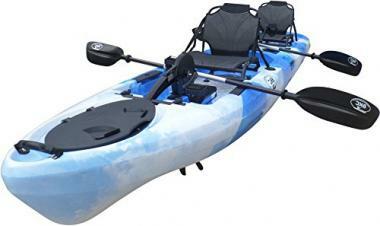 This sit-on-top fishing kayak with pedals has rotational pedals that powers the propeller drive system to enable you move faster using minimal effort. It doesn’t take up a lot of space on the deck and has a rudder handle to make steering easy. It weighs 85 pounds and is easy to transport. The Captain’s Chair Style seat provides comfort for a whole day while on the water and has tension knobs and on-the-fly adjustable gear tracks. It also has a mesh bow cover, bungee cords, two areas designed for mounting a fish finder or GPS, four molded-in rod holders and storage pods. Wilderness system is designed for versatility and different water conditions. It has S.M.A.R.T hull technology which boasts acceleration, stability, tracking, maneuverability and responsiveness. It’s a single person fishing kayak with a Helix PD pedal drive system that you can easily install and remove. This gives you the option of using paddle or pedal power whenever you want. 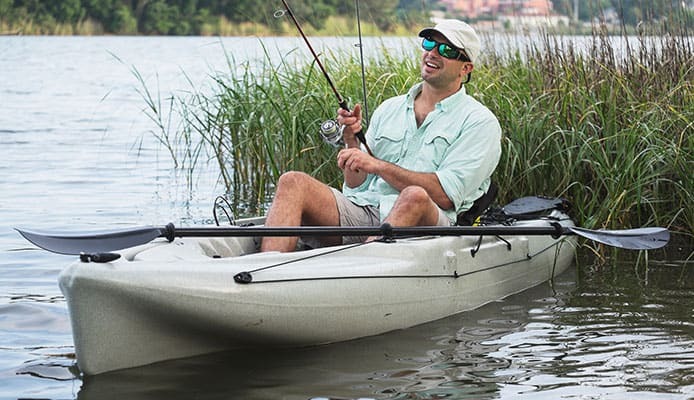 This fishing kayak comes with foot pedals, a standing platform to make fishing easy. You can stow easily the pedal drive if you’re entering the surf or in very shallow waters. It can also be used with the Helix MD motor drive with an additional purchase. It has a high weight capacity and features a bow hatch, spacious rear tank with bungee cords, flush with the deck for more space for standing or moving around and a watertight center hatch for storing smaller items. It also has built-in gear tracks for customizing your watercraft and additional fishing accessories as well as AirPro Max seat that’s adjustable to provide comfort. 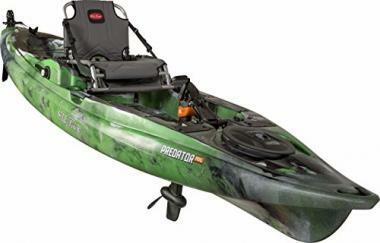 Predator PDL fishing kayak allows you to focus on fishing instead of maneuvering your kayak and the most advanced pedal-powered hands-free kayak. The patented docking system will enable you to deploy and dock the PDL drive while launching, landing or in shallow waters. It has maintenance-free PDL drive and measures 13 feet and 2 inches. This pedal fishing kayak has a 500 pound maximum load capacity with instant pedals both in forward and reverse. Most anglers prefers sit-on-top kayaks because they provide more room for moving around when dealing with fish. Sit-inside kayaks are great if you desire a drier ride. Long kayaks are fast and cover distances more easily. The downside to this is difficulty in transporting your kayak to launch sites. A kayak with pedals is usually heavy due to additional features like extra storage capacity since they’re designed for fishing use. Wider kayaks tend to be more stable and can support more capacity. The fishing kayak you choose should have enough space for storing all your fishing gear as well as your catch. You should be able to stop or turn quickly while having more control over the direction of your kayak. Many pedal kayaks have a mechanism that will allow you to lift the propeller or fins and enable you access shallow areas. Q: What Is A Pedal Kayak, And Why Would I Buy One? A: Pedal kayaks are watercrafts designed to be used with pedals and not a paddle. They’ve a propeller or fins underneath the hull and foot pedals on the deck to enable you pedal along. You’ll need to buy one to make your fishing experience easier. You won’t have to worry about holding your paddle as you try to cast your fishing line or reel in your catch. Q: How To Use A Kayak With Pedals? A: Install the seat and drive system once you get to the water. Sit in an elevated position with a more defined backrest and adjust the sit height and position to suit your activity or pedalling style. This will enable you to reach the pedals and kayak effectively. Use your feet and legs to pedal along and power your movement while in the water to free up your hands and do other activities like fishing. Also, make use of the ruder which is controlled by a handle near the seat. This will help you control the direction of your craft in order to move through the water in a straight line. When choosing a pedal fishing kayak, consider how much gear you plan to carry with you and the type of water you’ll be pedalling in. Also, check the kayak’s weight capacity and storage areas to ensure they meet your needs.